We are learning about rotation and fractions. 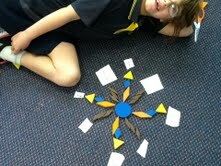 We made patterns by rotating shapes different fractions. 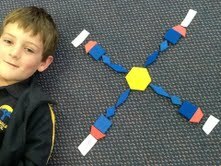 Look at some of our patterns. The shapes and the colours have to stay the same when you rotate. Can you work out what fraction we rotated them in? What is special about Faith's rotation?